since it had fallen to earth at the war leader’s deed of the hand. dressed in clean war garments, to where their lord lay. the warrior on foot near his lord’s shoulder. He still tried to revive him with water — thought not at all did that speed him. of each man, as it does yet. was easy to obtain for those who earlier had lost their courage. that he from battle won. that the prized prince would return again. he sits by the beloved and the reviled. the Merovingian have shown us no mercy. the mother of Onela and Ohthere. Ongeontheow the chief turned to higher ground. Hygelac’s sign rushed forward into the peaceful plain. “Afterward the Hrethlings thronged around that fortified enclosure. After the king had turned thither. the people’s protector, he was struck through to his soul. since they ruled that bloodied field. his hard sword hilt and his helmet also. These old ornaments were brought to Hygelac. among the people that reward would be had, and so he did. a tender home-shaper, his loyalty to lock. faces tear-torn, the terrible scene to see. lord of the Weders, died a wondrous death. never again would it know its earth den. even then only for such a man as the Ruler thought fit. 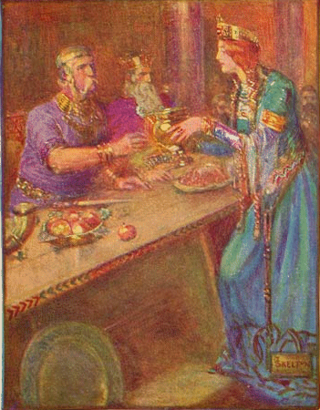 Beowulf predicts what will happen at the marriage of Hrothgar’s daughter and Ingeld of the Heathobards. It’s nothing good, that’s for sure. æfter hæleþa hryre, hwate Scyldungas? losað lifigende, con him land geare. From an outsider’s perspective, I think this passage sums up the cyclical nature of feuds quite nicely. For new readers and those who might not know what the flavour of early medieval feuds was, here’s a quick rundown: Group A holds a mutual grudge against Group B. Group B is living more or less peacefully near Group A until Group A decides to take revenge for that grudge. This encourages Group B to do the same with Group A. Group A then retaliates, and Group B does the same. The cycle only ends when a third group comes and sorts Group A and B out or one gradually kills the other off. Unlike your Hatfields and McCoys. An early medieval feud wouldn’t just fizzle, it basically ends when there’s no one left to feud against. But, put some flesh on that model, and you could very well end up with this passage. After all, the Heathobards clearly still hold some hard feelings for the Danes. All it takes for one of the next generation of them to lash out is a question. Though the old warrior’s question is pretty loaded. He asks if the young warrior remembers his father, if he remembers the heirloom that may be his by Heathobard rights, and implies that the young man could easily take it to avenge his father and restore the honour of his family (and by extension, the Heathobards). Out of those three major notes, though, I think it’s the last one that’s the most important whisper in this young man’s ear. Because also implied in the old warrior’s words is that the young warrior’s father must not be allowed to die in vain. Actually, there’s kind of a sense that such a slaughter as the Heathobards allegedly suffered at the hands of the Danes is unsportsmanike. Which is strange to say, but warfare has always had rules. The most important thing about this passage as it relates to the rest of Beowulf, though, is that it contradicts something that came earlier. Back on lines 1071 to 1158, a scop tells us the story of the Danes Hildeburh and Hengest and the winter they spent with the subject of a feud: the Frisian Finn. Here we have another situation where peace forged by marriage falls apart. There’s even a similar result. But the idea of relativism was certainly alive and well for the Beowulf poet because the Danes slaughtering the Frisians and then sailing away is seen as a victory. Told in the presence of Danes, how could it be any other way, right? But, reading it that way, I can’t help but wonder if Beowulf is catering to some prejudice of Hygelac’s with his prediction for the future Freawearu/Ingeld wedding. Maybe he’s just drawing up these lovely word pictures for his lord to better his own position at home. Or, since he’s back home in Geatland, is Beowulf simply being true to his feelings? Now that he’s back in Geatland, he’s just letting the truth out. Or is the only honesty that he knows a sword-point? Maybe this is simply another part of Beowulf’s monstrous qualities. He’s just too well adapted to fitting around every suggestion he faces like his sheath fits around his sword. Ultimately, the question that really needs to be asked (and with your tongue nowhere near your cheek) is this: Why is this passage included in Beowulf’s story about his time in Daneland? Is a slightly informed prophecy of a doomed alliance through marriage somehow relevant to the poem as a whole? Or is Beowulf just telling Hygelac what he wants to hear? Feel free to share your thoughts in the comments! Next week, Beowulf continues his story of his adventures in Heorot. Specifically, he talks Grendel. After some cajoling from his fellow Danes, Hengest kills Finn before leaving Frisia in the spring. that was amidst the Jutes a known weapon. I feel like finding sympathy for villains in this poem is something that I do a bit much of (see this entry in particular), but I can’t help but feel like there’s something in here regarding Finn’s feelings. I mean, from the sounds of it, Hengest almost left without exacting revenge. It’s not until Hunlafing gives him the famed sword, “War Radiance” (l.1143) and “Guðlaf and Oslaf/spoke of the sorrow of their sea voyage” (ll.1148-1149) that he acts. Or so it seems. These two actions turn Hengest towards killing Finn before leaving. And rightly so, right? Finn is one of the Danes’ sworn enemies – a Frisian – and so his wreaking vengeance makes sense. But what does it say about Hengest that he needed so much convincing? If Hunlafing hadn’t given him the sword famed from fights with the Jutes or Guðlaf and Oslaf hadn’t complained about how sorry they’d be coming back to Daneland lord-less and leaving his slayer alive, would he have killed Finn? I honestly don’t think so. I think Hengest, bitter as he was all winter, had started to like Finn, or at least respect him. The Danes, after all, had been at Finn’s mercy, and yet he respected the pact that his marriage to Hildeburh represented. Finn extended a hand of friendship to the Danes, even if only out of obligation, and he did not go back on any of his terms. Hnæf and Finn’s own son were burned together, a funeral was held for all who perished in the battle we never see, and the Danes go unharassed all winter. So it seems likely that Hengest, who must have been the second in command while Hnæf was alive (or at least shows the level headedness required of a leader), gradually had his grudge against Finn worn away through exposure. The ember of his hatred for the man and for his people would likely remain since this is a feud we’re talking about, but if Hunlafing, Guðlaf and Oslaf hadn’t fanned that ember back to life, I think the Danes would’ve left without incident. But instead they kill Finn and run off – but not before committing another act to perpetuate the feud. Though that act is mentioned in the next part of the poem. So let’s pull back for a second. As a sword guy I just want to point out the significance of the sword Hunlafing shows Hengest. Because I think that’s probably more of a factor in what Hengest did than Guðlaf and Oslaf’s needling. After all, as a sword that “the Jutes knew well,” it’s safe to say that it was a battle-hardened sword. Since this is a sword that seems to have been wrapped up or tucked away, it was probably Hnæf’s own weapon. As such, it probably rampaged through the battle that came before we see Hildeburh mourning on the battlefield, and so the memory of it would be fresh in Finn and the Frisian’s minds. Or maybe they actually wouldn’t remember it at all. What makes the reputation of the sword “War-Radiance” important is that the Danes perceive it has such a thing. Because more than idle talk of people back home thinking them dishonourable cowards for not killing Finn, showing a concrete artifact that represented the feud between Danes and Frisians, I think, would really get Hengest thinking about revenge. Because it would remind him of all the conflict between the two in the past, such a reputed sword would stand as a testimony and representation of their feud and its enduring nature in steel. Plus, if “War-Radiance” was Hnæf’s, there’d be the twinge of duty Hengest would no doubt feel, the duty to avenge his lord at last, perhaps long since his initial feelings of frustration and anger had cooled. Which do you think pushed Hengest toward killing Finn – the sword or Guðlaf and Orlaf’s telling him they’d be dishonoured back home? This passage’s compounds are pretty clear-headed. Perhaps because of the dire nature of the act the poet sings of here. After all, it’s not a battle in which you could become ecstatic in the telling, swinging compounds about like tree trunks, it’s a revenge killing of a lord in his own hall after having been his guests for the winter. It brings a chill into springtime. So the compounds are just as cold – but not less interesting. Especially line 1143’s “hilde-leoman.” This technically isn’t a compound word since it’s the name of a sword, but that name is two other words smashed together, so here we go! The word “hilde-leoman” comes from the compounding of “hilde” (“war,” or “combat”) and “leoman” (“ray of light,” “beam,” “radiance,” “gleam,” “glare,” or “lighting”), and I’ve chosen to translate it as “War-Radiance” (Seamus Heaney went with “Dazzle-the-Duel”) I think both have their merits. But what’s interesting about this compound is that it’s a sword’s name. We see other named swords in this poem. There’s Hrunting and Nægling later on, for instance. But these are actual names, not just two words a poet (or someone) slammed together. Sure, the usual alliteration comes to play with “hilde-leoman” (“Hunlafing hilde-leoman,” with the line’s cæsura right in the middle, perfectly bridges the gap), but it’s still neat that the name is just two words combined. Plus, naming a sword something like “War-Radiance” makes sense. As a sword’s raised over and over again in a battle it’s going to catch whatever light there is on the field, especially if it’s constantly being swung but also being kept constantly clean either with quick wipes or jerky swings that shake any blood or gore free from the blade. So “War Radiance” (or the more personable” Dazzle-the-Duel”) makes an almost onomatopoeic sense (at least in Modern English). The word “world-rædenne” (l.1142), meaning “way of the world,” is also kind of neat. Though more for its concept than anything to do with the word’s parts, those being “worold” (“world,” “age,” “men,” “humanity,” “way of life,” “life,” “long period of time,” “cycle,” or “eternity”) and “ræd” (“advice,” “counsel,” “resolution,” “deliberation,” “plan,” “way,” “design,” “council,” “conspiracy,” “decree,” “ordinance,” “wisdom,” “sense,” “reason,” “intelligence,” “gain,” “profit,” “benefit,” “good fortune,” “remedy,” “help,” “power,” or “might”). I mean, no matter how you slice it, it basically comes back to meaning something pertaining to life and its order. The implication being, though, that killing Finn is just the way to go, it’s just what Hengest has to do as a rule of the world. But I wonder if part of this editorializing on the part of Hrothgar’s poet sheds some light on the Anglo-Saxons’ view of history. Namely that history wasn’t something fluid that changes with every teller, but that it was something solid, and that since history was solid and fixed, so too what was to come. Though, obviously, what was to come couldn’t be read by people. So maybe there’s some determinism in that word, Hengest not being able to resist killing Finn simply because Danes and Frisians feud, and Finn’s murder would keep that going. It offers some insight into how a deterministic view of the past can lead to a deterministic view of the present and future, too, I think. And “sæ-sið” combines the nearly Modern English “sæ” (“sheet of water,” “sea,” “lake,” or “pool”) and “sið” (“going,” “motion,” “journey,” “errand,” “departure,” “death,” “expedition,” “undertaking,” “enterprise,” “road,” “way,” “time,” “turn,” “occasion,” “late,” “afterwards”) to give us “sea voyage” and almost nothing else. Though there is an implication that any kind of “sið” could be a euphemism for death since that is one of the word’s definitions according to Clark Hall and Meritt. Do you think that the sword’s name, “hilde-leoman,” is something the poet came up with entirely for alliteration or because it was actually a sword’s name? Maybe both? Next week we hear the rest of the story of Hengest and Finn, and see what the Danes do before they leave Frisia. Hrothgar’s poet continues his recital. In this poem within a poem, Finn and Hengest conclude their peace treaty, including a mention of what will happen should the treaty be broken. nor through any artful intrigue complain of it. So 11 lines more and then we see the end of the negotiations between Hengest and Finn, between Dane and Frisian. There is some tension here, and it’s pretty clear that the Danes don’t want to have to sit and wait with the Frisians. But it’s still quite a mellow section of the poem as a whole. But perhaps that’s because this part of Beowulf is really reliant on knowing the history behind it. Actually, without Hildeburh to relate to Grendel’s mother, or something else to relate to the main action of the poem, there’s nothing except history for us to really grab onto. Though we can definitely say with confidence that the “blood feud” (“morþorhetes” (l.1105)) between the Danes and Frisians that this treaty is supposed to quell will probably break out. But maybe there’s something about the feud between Grendel and the Danes in there. Without the historical context, but with the trope of the feud that’s gone on so long neither side can remember the reason for it, maybe the poet is telling this story to Hrothgar, Beowulf, and the assembled Danes and Geats as a kind of joke about the situation with Grendel. But to really get a handle on that we’ll need to see the conclusion of the poem first. If Dane and Frisian don’t bloodily clash in the poem’s final lines, but instead amicably part ways then this little diversionary poem is indeed mysterious. But I don’t think the poet would include lines like 1107’s threat of any disputes with the treaty being settled with “the sword’s edge” (“sweordes ecg”) if this poem didn’t end with some sort of fight. Anyway, the peace terms themselves (since that is what this passage of the poem is about), offer at least some insight into Anglo-Saxon culture. At least in terms of ideals. Ideally, counsellors would be listened to, guests/hostages would be treated honourably lest a greater force come seeking to fulfill a renewed blood feud, and, ideally, those who don’t like the treaty are kept in line with the threat of harm or death. Which is kind of a funny way to enforce a peace treaty (I can’t help but visualize a parent snapping a belt as they say “now play nice – or else!” while standing over fuming siblings), but there you go. Though violence may have been the only deterrent, since I get the impression that Danes and Frisians didn’t have much in the way of trade. Plus, this is a treaty between two small sub-groups after all, not an out and out treaty between two entire peoples. Also, it’s good to see that just who is who is cleared up. The slain ring-giver of lines 1102-1103 was the Dane’s. Even without the historical context for this story, the “them” of line 1104 suggests the Danes since it refers to the people that the Frisians are reminding, and since it’s just Danes and Frisians here, there’s no one else that “them” could refer to. Also, the poet singing this story is himself a Dane, so it makes sense that they’re the underdogs here (just as they were against Grendel, lending some weight to my idea that more than Hildeburh’s mourning relates this little story back to Beowulf at large). So it sounds like the Danes are without a leader. But if one side’s leader remained, why not just envelop the weakened side while you hold the advantage? Let me just take a quick look at Wikipedia’ entry on the this part of the poem (under the “Finnsburh Fragment” entry). Hildeburh was Finn’s wife, and their marriage was meant to bring harmony between the Danes and the Frisians. So Finn, leader of the Frisians, obviously wanted peace. Hence, he makes a treaty with the Danes rather than just destroying them. So Finn’s desire for peace is likely genuine (not unlike the well-meaning, but wrong-headed parent from a day dream a few paragraphs back). But that’s obviously not something that’s shared among the other Frisians, since any mention of the Danes serving their lord’s slayer is made punishable by death. And with good reason. As poems like the Battle of Maldon make clear, loyalty to your lord was paramount in Anglo-Saxon society. So there could be no greater insult than to dishonour your former leader by turning around and working with his killer. Working with your lord’s slayer in any capacity – whether it was simply signing a treaty or running his errands – was the ultimate slander to your fallen leader because it suggests that he inspired no loyalty in those he lead. And, though it might’ve been fuelled by gifts of treasure, a true comitatus (or warrior band) was held together with loyalty. True warriors would stick with their leader no matter what, confident that in the end they would get their reward. But Finn’s desire for peace doesn’t really clear up why the Danes are hanging around. Are they hostages? Are they trapped by winter’s icy water? Or is there something else keeping them? I’ve already thrown in my guess that this peace treaty between the Danes and Frisians won’t last. Do you think it’ll make a difference and bring the two groups together, or that it will end in bloodshed? Because of the tension the negotiation between two bitter rivals in this passage, it’s full of compound words. But what makes these compounds really stick out is that this passage’s compounds tell a story. Here goes. Simply enough it comes from the words “friðo” (“peace,” “safety,” “protection”) and “wær” (“true,” “correct,” “faith,” “fidelity,” “keeping,” “protection,” “agreement,” “treaty,” “compact,” “pledge,” “covenant,” “bond (of friendship)”). So right there in the constituent words you can see the meaning of “peace treaty.” It’s just as straightforward as such a treaty should be. But things thicken on line 1101. This is where “inwit-searo” is mentioned. This word, meaning “artful intrigue,” comes from the words “inwit” (“evil,” “deceit”; or “wicked,” deceitful) and “searo” (“art,” “skill,” “cleverness,” “cunning,” “device,” “trick,” “snare,” “ambuscade,” “plot,” “treachery”; as well as “work of art,” “cunning device,” “engine (of war),” “armour,” “war-gear,” or “trappings”). So now we’re faced with a kind of “cunning evil” or “wicked snare,” perhaps the machinations of someone or some group against the peace treaty mentioned above. But what makes these machinations plot-thickening is that they aren’t direct. This isn’t a compound word for “fight” or “sword” but instead comes from a sense of malicious intelligence that has set pieces up only to knock them down in a clever way. In fact, “inwit-searo” describes just the kind of act that could spark a “morþor-hete,” or “blood feud” like the one on line 1105. This word combines “morþor” (“deed of violence,” “murder,” “homicide,” “manslaughter,” “mortal sin,” “crime,” “injury,” “punishment,” “torment,” or “misery”) and “hete” (“hate,” “envy,” “malice,” “hostility,” “persecution,” or “punishment”). Without knowing exactly what the big rivalry between Dane and Frisian was, I can’t say if these three compound words tell the probably forgotten origin of the feud between these two peoples. But it is rather neat to see the compounds lined up like this. It might just foreshadow this poem’s own end, but we’ll find that out in four weeks. Blood feuds were a common problem in Anglo-Saxon society and the early medieval period in general. But, feuds continue to be a super popular idea in TV and movies. Why do you think we still tell stories about feuds? Next week, following up on forging this peace, the poet turns to tell of the funeral for all those slain in the tragic combat of Frisian and Dane.